A new community response network for lesbian, gay, bisexual, trans, two-spirit, and queer/questioning seniors is launching in the Lower Mainland this month. The Lower Mainland LGBT2Q+ Community Response Network aims to shine a light on issues faced by queer and trans seniors, and help them access resources for aging well. The report recognized that despite increasing acceptance of the LGBT2Q+ community in Canada, the effects of past discrimination have had a huge impact on seniors. Today’s seniors, who grew up before these social and legislative changes, have had different life experiences with regards to their gender identity and sexual orientation, says the report. Our youngest seniors had turned 15 years old before homosexuality was decriminalized in 1969 – and some of our older seniors may have been imprisoned before this legal change. As young people, many of our LGBT2Q+ seniors also risked emotional and physical hurt if they took the brave decision to come out, and even then, many never told their parents. And despite decriminalization and the birth of the Pride movement, as young people our seniors faced public opposition and repression. Some were driven to contemplate suicide. The numbers—or lack thereof—speak for themselves. In 2014, 3% of Canadians aged 18 to 59 self-identified as lesbian, gay or bisexual. But there is no data for Canadians aged 65+. The report points that the discrimination faced on a day-to-day basis by LGBT2Q+ seniors can have short-term effects in terms of social isolation—but worse, past discrimination can have long-term effects if these negative perceptions are internalized. “Among homosexual or bisexual seniors, for instance, this phenomenon—referred to as homonegativity—is associated with a negative image and the invisibility of homosexuality in society,” states the report. All of which can lead to issues of abuse, neglect, and self-neglect of at-risk LGBT2Q+ adults. The Lower Mainland LGBT2Q+ Community Response Network hopes to tackle these issues by bringing together a wide range of community and government groups across the region. Members will include LGBT2Q+ seniors and their allies, senior and LGBT2Q+ service providers, municipal governments, health authorities, consumer groups, neighbourhood houses, universities, and cultural faith-based organizations. Meanwhile, the new network will cover the Metro Vancouver and Fraser Valley Regional Districts, as well as the Sea-to-Sky Corridor and the Sunshine Coast, where appropriate. Encourage LGBT2Q+ seniors, designated organizations, community groups, families, and individuals to get involved in the network. Continuously evaluate resources, programs, and activities focused on reducing risk of abuse, neglect, and self-neglect of LGBT2Q+ seniors. Coordinate efficient and effective delivery of these services. Provide education, outreach, and resources to ensure the safety of at-risk individuals. Promote civic engagement and social contact of at-risk individuals, including their representation in groups and activities relevant to their safety and well-being. Support programming and activities which reduce risk to LGBT2Q+ seniors. Advocate to protect and extend services that reduce risk to LGBT2Q+ adults. 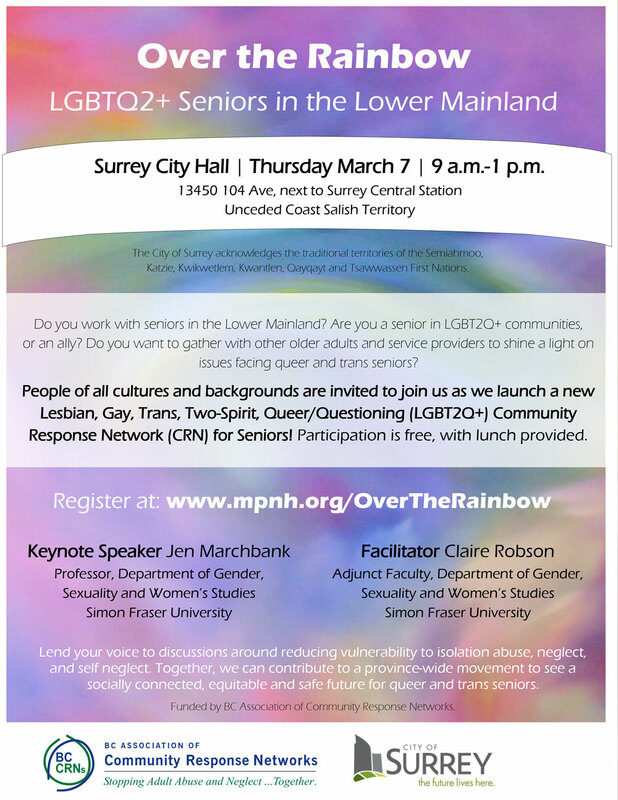 The new network will be holding a launch event at Surrey City Hall on Thursday, March 7, open to people of all cultures and backgrounds, to discuss reducing vulnerability of LGBT2Q+ seniors. If you are a senior in the LGBT2Q+ community, an ally, or if you work with seniors in the Lower Mainland, the network would particularly like to see you there. Working together, the network hopes everyone can contribute to a province-wide movement to see a socially connected, equitable and safe future for queer and trans seniors.